Written by Access MVPs and Microsoft Access testers, this resource will give you the tools to leverage Access 2007's built-in functionality and VBA in order to build more dynamic applications. 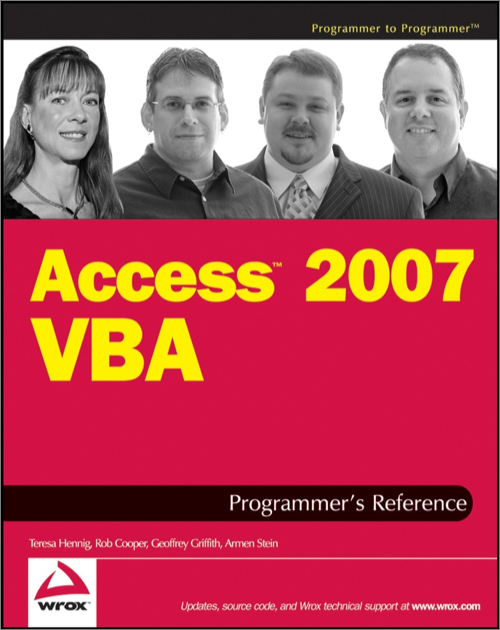 It explores all aspects of VBA programming for Access and describes the latest innovations. You'll also find several commonly used techniques and sample code to help you get started, as well as expert tips to make your code easier to maintain. The expert author team will show you how to create and name variables, manipulate data using Data Access Object (DAO) and ActiveX® Data Object (ADO), handle errors, and create classes. You'll also learn how to utilize the latest wizards as well as modify and enhance the code that the wizards create. And you'll learn how to take advantage of key new objects, enhanced macros, and the Office Ribbon. This book is a comprehensive resource for Access users and VBA developers who want to increase the power of Access using VBA.